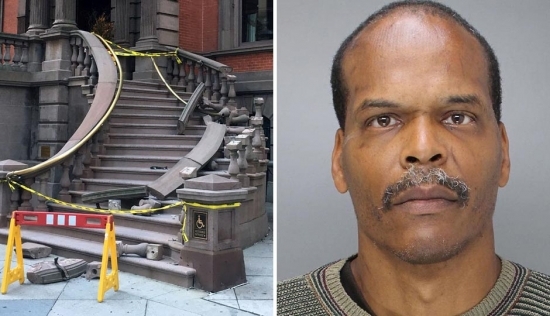 Philadelphia Police have identified the man wanted in connection with the theft and destruction of the front staircase of the Union League in Center City. An arrest warrant has been issued for 50-year-old Reginald Phillips, whose last known address was on the 3100 block of N. Broad Street. Phillips was caught on surveillance camera pulling the brass hand rail off the stone staircase which came crumbling down. He then walking off with the railing. The damage is estimated at $100,000. Any with information on the whereabouts of Reginald Phillips is asked to contact Central Detective Division at 215-686-3093. UPDATE:Philadelphia Police announced that 50-year-old Reginald Phillips was taken into custody at 11pm on Wednesday. Philadelphia Police have released surveillance video of the smash-and-grab robbery at Boyd's in Center City early on Tuesday morning. It happened at 4:41 a.m. at the high end men's apparel store at 1818 Chestnut Street. Video shows a red 2016 Toyota Rav4 back into the front display window, smashing the glass. A silver 2012 Mercedes Benz S350 also pulled up and parked outside. Several people got out of both vehicles and went into the store. They exited carrying numerous items of clothing and fled in an unknown direction. The suspects made off with $45,000 in men's suits and other accessories. 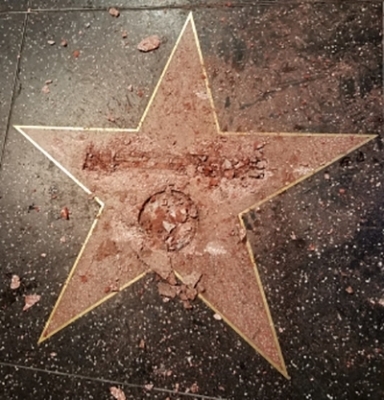 The star on the Hollywood Walk of Fame honoring Republican presidential nominee Donald Trump was vandalized overnight in Los Angeles. Police were notified of the damage just before dawn. They discovered that the star had been destroyed by a hammer and that the brass lettering and medallion were missing. The star is located between Orange Drive and Highland Avenue on Hollywood Blvd across from the El Capitan theater where Jimmy Kimel films his talk show. The star had been targeted by vandalism before, but not to this extreme. It was dedicated in 2007 for Trump's work on The Apprentice. A man named James Lambert Otis claimed responsibility. He wanted to remove it and auction the star to raise money for the woman accusing Trump of sexual harrassment and assault. LA police have video of the incident and hope to make an arrest. See photo of the damaged star below.